These guides should be no wider than the length of your trowel. The length of your top and bottom guide should be approximately equal to the length of your straight edge. If the wall is a lot longer than this you will need to read the coping with bigger walls. 5. When you have applied the second coat turn your trowel through 90. so it's on it’s side and position it flat enough on the wall to be used to flatten (leading edge approx 10 – 15 mm). Running your trowel from side to side over this plaster will act to flatten. 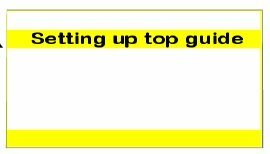 6.The top guide is now ready to be ruled off. With the straight edge in a horizontal position place the edge at the bottom of the top guide. Applying firm but even pressure - move the straight edge from side to side as you gradually move it up the wall. 7. You should see straight edge marks where the straight edge has touched. Where it has not touched will still be smooth, signifying it is a hollow spot which needs to be filled with more plaster. Before you do this just check that the ruled off areas are not too thick and that they are running parallel to the wall. (i.e. that the right hand side is the same thickness as the left). If they are not then run the straight edge over, putting more pressure on the side that needs to be thinned down. Once this has been completed you may find there are no longer any hollows. If there are then fill them with plenty of plaster. Avoid touching the ruled off areas with your trowel. 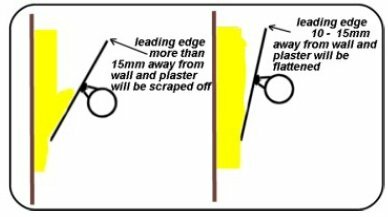 Don’t try to get the plaster too flat – it’s more important to get an adequate thickness of plaster - as the straight edge will rule off the excess thickness. If you have any more hollows then repeat this process until you see horizontal straight edge marks throughout the entire area. Once you see straight edge marks everywhere you know the whole area is flat. Avoid all temptation of running your trowel over these straight edge marks as you will only push it out of shape. 8. Repeat steps 3-7 for the bottom guide. At the bottom of the wall it can be difficult to apply enough pressure which means there is a tendency for this area to bulge. Extra effort should be made to keep the guide vertically flat and ensure it doesn’t bulge right at the bottom. To help with this aspect the starting point for your trowel should be approximately 50mm up from the floor. This gap can then be filled simply by loading a very small amount on to your trowel making it easier to keep flat. 9. You should now have two guides – one for the top of the straight edge and one for the bottom. Before continuing with the middle section these guides need checking to ensure the top and bottom guide are a similar thickness. Hold the straight edge in a vertical position at one end of the wall so that the top of the straight edge is resting on the top guide and the bottom on the bottom guide. The straight edge should be touching the whole guide. If there are gaps of less than 5mm this is acceptable but if the gaps are more than 5mm you may need to rule off more plaster off the high spots or apply more to the low spots so that the guide sits flatter on the wall. As well as checking this vertical flatness you should also look at the gap between the straight edge and the wall to check that it is running parallel to the wall. If not then adjust the thickness of the top or bottom guide as required. It is at this stage, that if your wall needs to be totally plumb (level) you can hold a spirit level on your straight edge to check, and adjust thickness of top or bottom guide as necessary.